That's 'hi' in Gaelic. Yep, I'm in Ireland. Dublin to be exact. But honestly, I would never say hello like that. In Dublin, I say, "hiya". I've got a full day planned... shopping at Penney's, getting my haircut, lunch at Wagamamas followed by tapas tonight with Mrs. London and a friend (The Husband will be at the Amlin Cup Final watching Leinster take on Paris... and yes, The Husband is rooting for Leinster). 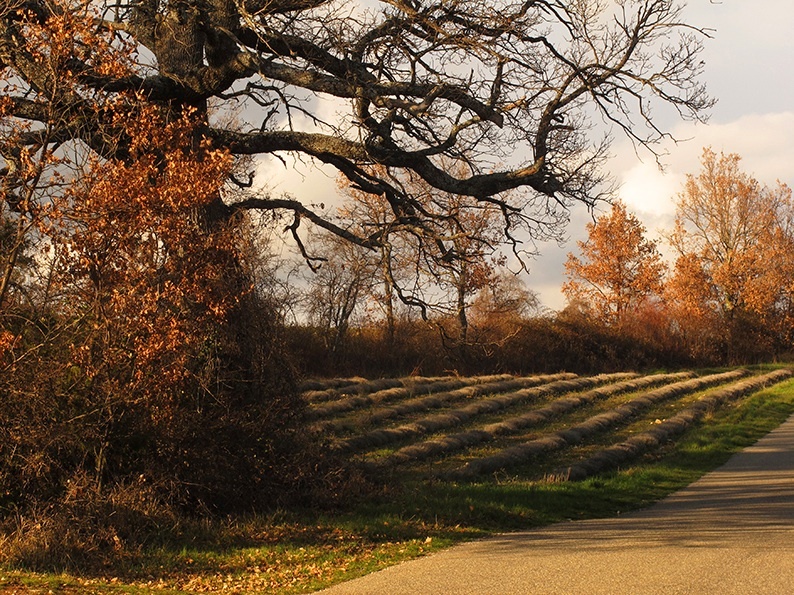 So while I'm getting my Dublin on, I'll take you back to France with my friend Heather from Lost in Arles and her post about her love of the land near The LPV. "Well, it is up to you to choose", Remi, my companion, offered gallantly. The Easter Bullfights in Arles were fast approaching and so it was time to flee, to be anywhere but in the midst of the partying hoards that swallow our small town each spring. I had done my homework. We don’t travel as much as we used to, so I wanted to choose just right, certainly as we had gone through a stressful past few months and were in need of a dose of quiet. I had found an amazing cabanon, miniscule but beautifully placed on the Gardon River outside Uzes to the east. It was the definition of idyllic. I imagined dipping my toes in the cool water with a glass of rosé in hand as our two Goldens took their first swim of the year. 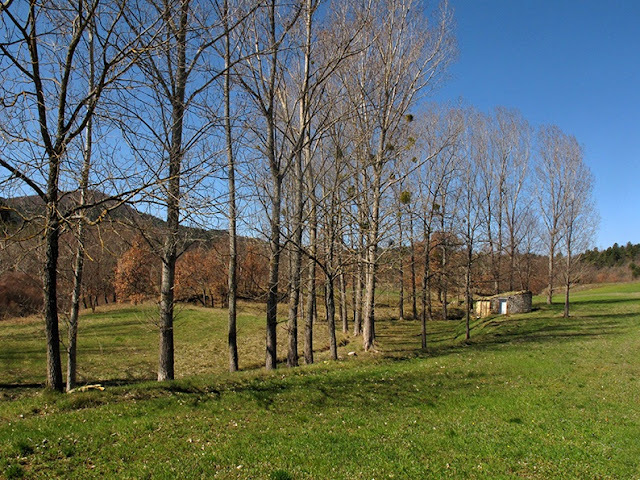 And yet…my thoughts kept returning to the Upper Luberon, the Alpes-de-Haute-Provence. We had gone twice in 2012, first as an escape for the September Bullfights (yes, thankfully they are only twice a year) but also a following visit just for the pleasure of digging in to what we had found. I admit that I was thinking back to the food. We love to cook and were blown away by the regions fine, fine ingredients—the pungent ooze of Banon cheese wrapped in chestnut leaves, the free range lamb from the Pays de Sault and the tender porc de Mount Ventoux, lavender honey, the earthy Pays de Luberon red from the Sylla Co-operative in Apt. Did I mention that I am a bit of a sybarite? Guilty as charged. But it was the lay of the land that forced my hand. There is an inherent peace in the rolling hills and an infinite variety in the trees that charm. Remi, who grew up in Grenoble, was happy to rediscover a smaller version of the mountains of his childhood while I was reassured by topography similar to our horse farm of my Ohio youth. What is it in that as we get older we want what we used to have? The comfort of the past with a dose of new was just what the doctor ordered. And so we left the crowds behind and headed north. For there is relatively no one there. 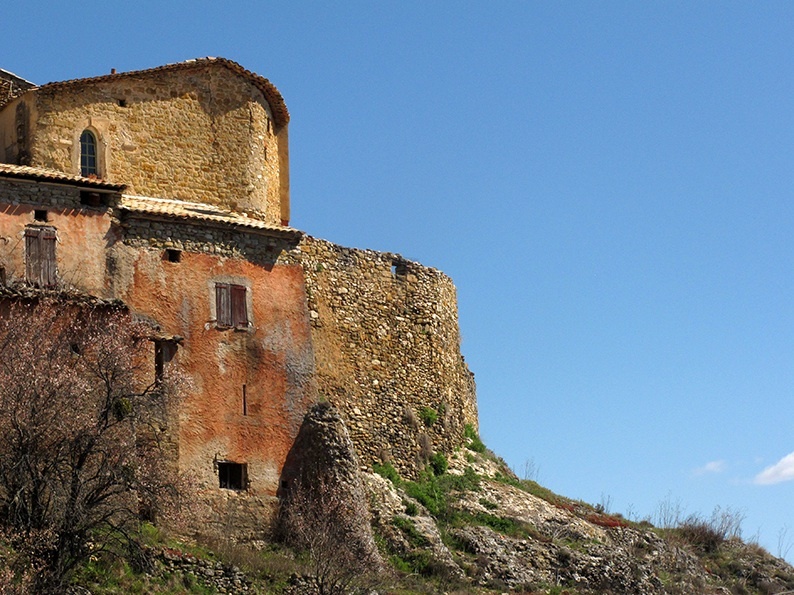 While the area that I love, around Simiane-la-Rotonde, is only a mile away from the border of the Luberon, it is a very different atmosphere. It is authentic, not trying to impress. Because it doesn’t have to. 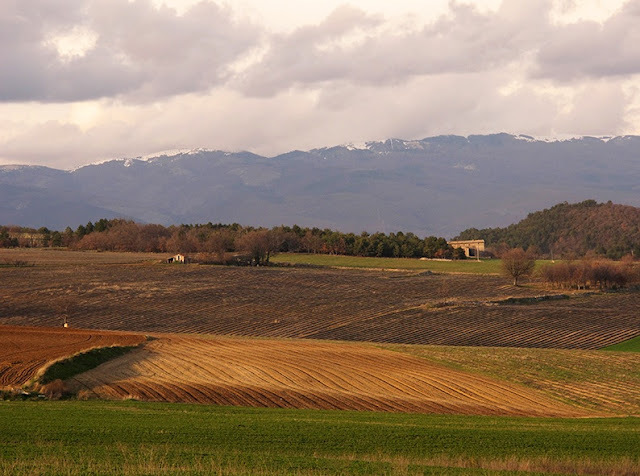 As we had on our previous trips, we drove and drove, exploring from the red rust dust of the Colorado Provençal to the zen garden stripes of sleeping lavender fields above Revest-du-Bion and the still powdered peaks of the Lure Mountain. We hunted for cabanons to inhabit in our imaginations as we went but we knew it was a sign that this gorgeous land spoke to us. And that we would be heading back to the land near the LPV all too soon. That area is so lovely. We went to a medieval fair in Simiane 2 years ago , it was fantastic fun (and really hot). 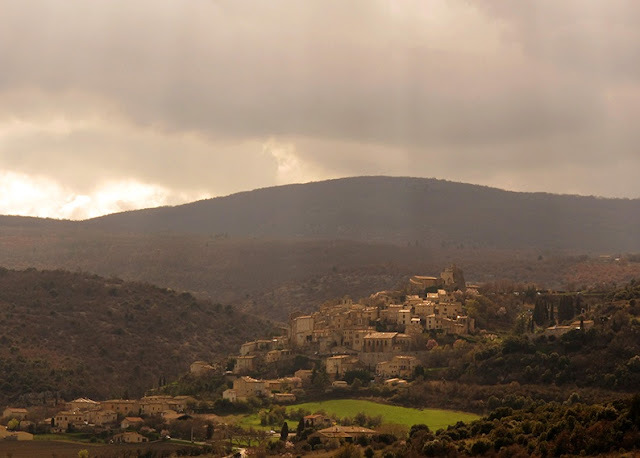 I wish we'd gone back again, but it's hard when there are so many other gorgeous Luberon villages beckoning. Your lovely photos bring it all back. I have never been to this region and it is stunning! Heather's blog is beautiful and she is incredibly talented. Oh and her two pups are cute too! We love the Luberon but unfortunately have not had a chance to do lots of exploring of the Alpes-de-Haute-Provence but like you Heather we love Simiane-la-Rotonde. Great post Heather! Sara, I hope you have a great time in Dublin. What beautiful photos, and such a stunning area. I don't know the area well although I have been to Mont Ventoux and around on the motorbike. I must remember the names of the villages you mention and go back. Sara - I hope you have a jolly time in Dublin! These are such pretty photos. Hope you're having a blast in Dublin!! These photos are stunning!! Thanks for sharing and have a lovely trip to Ireland. And, I am so happy to have found you through Lost in Arles...I am a now a follower! These photos are phenomenal and look like you had before pleasure and luxury laid out at your feet! Ahh, 4 weeks today and I'll be off there! How delighted to find you, through Heather Robinson, whose blog I have been following for a couple of years. I am your new follower so look forward to reading future blogs. Enjoy your stay in Dublin and please leave some items in the shops for me. Lovely photos.......Heather as per the NORM! I know that life on the LPV has moved on but I did want to say thank you to everyone for the kind comments and to the Divine Sara for asking me to guest post!